Yoshi's New Island is a perfectly pleasant video game that I have a hard time recommending. It's technically a new game, though there isn't much novelty in this purportedly-new Island. Sure, the 3DS sidescroller has all-new levels, but the game feels less like a sequel and more like a remix and an inferior rehash of the incessantly-innovative 1995 Super Nintendo game Yoshi's Island. Considering that many new games in a video game series fail to outclass their predecessors, that wouldn't normally be a problem. With this new Yoshi's Island, however, it is. The '95 original still holds up technically, does everything good that the new game does and more, and is still worth playing now. It might seem unduly harsh to knock the new Yoshi game, given how colorful, cheerful and pleasing it is. What kind of cold heart couldn't be warmed by the return of Nintendo's adorable, egg-chucking dinosaur? Sadly, for someone like me who played and loved the first Yoshi's Island, it's hard not to look at Yoshi's New Island in the coldest of ways and see it as some sort of business decision gone wrong. This was a strange game for Nintendo to produce. 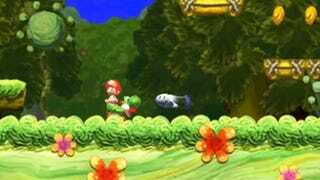 The original Yoshi's Island, the one from which Yoshi's New Island cribs dozens of excellent game design ideas, was re-released in 2011 on the 3DS in the form of a copy of the Game Boy Advance port of the original. It's still an excellent game and plays well on Nintendo's newer handheld. For the last week or so, I've been flipping back and forth between the original Yoshi's Island (above) and this new one, both on my 3DS. I can't ignore the old game. It dominates my impressions of the new one. Given that the controls and gameplay mechanics are basically identical across the two games and that the art is strong in both, the meaningful differences are almost all about level design. The new one is enjoyable, but the old one is consistently more fun. Good is good, but great's better and makes good look pretty bad. Instead of doing a wide re-release of its classic game or even some sort of higher-resolution remake, Nintendo has instead commissioned a development studio called Arzest to make a fresh Yoshi's Island. One wonders what the point was, given how good the old game still looks, how well it plays and how little Yoshi's New Island does with the series. The first Yoshi's Island was as fresh a video game sequel as there's ever been. Technically a follow-up to Super Mario World, it changed even the most fundamental rules of Nintendo's long-running Mario games and it kept throwing new ideas in level after level. What was new in Yoshi's Island is back in New Island. Both games play like a hybrid of a platformer and Nintendo's take on a 2D shooter. Yoshi, see, can swallow his enemies, plop them out as eggs and then chuck them. Players aim a targeting reticle that tracks in an arc in front of Yoshi. The player aims the egg and fires. Along the way, Yoshi carries a baby version of Mario on his back. These games are about Mario's infancy, after all. Well, sort of. Unlike adult Mario in the Super Mario Bros. games, Yoshi is hard to kill. He'll die if he lands on spikes or falls into a bottomless pit, but enemies can't hurt him. Instead, they knock Mario off his back. Baby Mario is immediately encased in a bubble, starts crying and floats up the screen, moving left and right to make him harder to catch. A timer starts counting down. By default, it only gives you 10 seconds. If Yoshi can't grab him before it winds down, the player essentially loses a life. Yoshi games don't play like Mario games. Playing a Mario Bros. level well might involve fighting the most efficient line along which to run, jump and attack. Playing a Yoshi's Island well has always involved more slowly poking through a level and finding its hidden collectibles. Each Yoshi level, then and now, includes 10 red coins, five floating flowers, and enough little stars that could raise the baby-Mario timer from a default 10 seconds to 30. No other sidescroller plays like a Yoshi game. The original Yoshi's Island was filled with fresh ideas, and so many of them show up in the new game. One level would introduce the concept of a boulder that you could roll throughout a level to crush enemies but that you could also use as a stepping stone to reach hidden areas. The boulders are back in New Island. The original game had levels designed around the idea of massive spheres falling from the sky and chopping up the level's terrain. That's back. The original let Yoshi transform into various vehicles. Back. A dog called Poochy that Yoshi can ride? Back. Perhaps it's hidden in a level I didn't unlock en route to clearing the game, but the only great idea from Yoshi's Island that I didn't find in the new one were the enemies who make Yoshi drunk. Advantage: Yoshi's Island, I think. There are few new ideas in the new game. Giant eggs, for one. Maybe the Shy-guys who move part of the level scenery around are new? They are one of the few elements I didn't recall from the original. It's nice to see classic Yoshi's Island concepts back, but it'd be more exciting to see them in a game that did great things with them. Yoshi's New Island's levels are mostly pedestrian. The game seldom implements its borrowed ideas with any creative spark. It's hard to describe that absence, but it contrasts poorly with the presence of the charming surprises in the first. Yoshi's Island, for example, threw a joke at the player by first conditioning them to expect the game's wizard to regularly create the game's bosses by casting a spell that super-sized normal enemies. 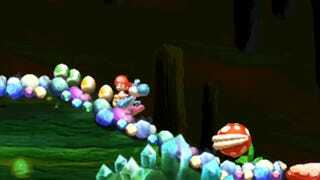 In one level the wizard instead shrinks Yoshi, who is promptly swallowed by the enemy. The boss battle occurs in the enemy's stomach. Yoshi's New Island just super-sizes all of its bosses. No twist. It might be tough to top a game whose first boss was defeated by throwing enough eggs at him to make his pants fall off, but, hey, imagine if they did. They didn't. Worse, sometimes Yoshi's New Island implements a Yoshi's Island concept in an inferior way. Take the vehicle transformations, which Nintendo has highlighted in the game's ad campaign. 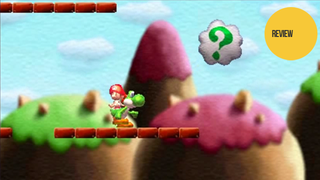 In the new game, Yoshi finds doorways in the game's levels, goes through them to turn into a car or a submarine or whatever and then must be steered, using the 3DS' motion sensor, through some obstacles and enemies. In these zones, Yoshi is on a timer, which can be extended by picking up clocks as he charges through. If the timer runs out before the player gets him to the end of the course, Yoshi is warped back to outside the doorway. Yoshi can go inside again for a retry. That's ok, but it is basic and feels uninspired. 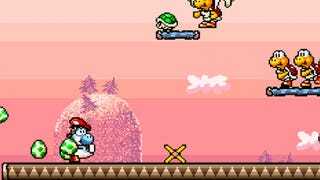 In the original game, Yoshi transformed by touching items sprinkled throughout the game's regular levels. He wouldn't be warped somewhere new. He'd be in the main level. He'd be on a timer and could extend the timer, same as the new game, but if the player failed to get him to a target destination, the game would snap Yoshi back to his starting point as if he'd been tethered by a bungee cord. As Yoshi got pulled back, the player would see the part of the level they'd just steered Yoshi through scroll by in reverse. That difference is subtle but significant. In seeing the path they'd just gone through, players could scan the scenery and mentally plot a new route. That approach invited more strategic playing, planning and retrying. It was more fun. For all of the safe things Yoshi's New Island does, its creators deserve credit for taking chances with the game's art. The first Yoshi game (above) was artistically unusual enough, presenting players with what appeared to be a game world drawn with magic marker and colored by crayons. It still looks magnificent today. The new game is similarly aesthetically bold, this time making it appear that Yoshi's new adventure occurs in a world illustrated by Vincent Van Gogh, Paul Gauguin and other masters. The implementation is uneven. The switch from one art style in one level to another in the next can be jarring, but the new game does use its palette to create some gorgeous sights. Coupled with a return and improvement of the great sound effects and sound design of the original, Yoshi's New Island at least looks and sounds better than average. The gameplay and the level design simply hold it back to a disappointing degree. It's common to see game publishers finance sequels that don't change a franchise that much and there are certainly merits to taking a classic game, identifying all of its best ideas, and crafting a new game out of them. This is, in fact, what was accomplished successfully with Yoshi's New Island's apparent actual spiritual predecessor, the popular 2006 Nintendo DS game New Super Mario Bros. Like Yoshi's New Island, that Mario game wasn't all that new. Instead, it was made to feel classic. It was a throwback, remixing traditional 2D Mario sidescrolling concepts. With Mario, that felt like a creatively rich move. The Mario series had gone 3D for a decade. A return to classic 2D design was exciting and felt inspired. Yoshi's New Island gives off the feeling of watching a movie remake instead of watching the perfectly-preserved and still exceptional original. It feels like eating a decent cook's meal that was made from the recipe of a master chef. It's fine. It's simply not great. Play it if you can't access your copy of the original, or if Nintendo won't sell you another one. Yoshi's Old Island is the game I recommend. There's little reason to accept the substitute.